When King Shahil Varman decided to shift his capital from Bharmour to Chamba, he was probably attracted by its remoteness. Surrounded Shah Madar hills on the east and swift flowing Ravi on the west, Chamba was truly impregnable. While these features kept the invaders away they also made traveling to and from Chamba quite difficult. Thus for a long time the town lay isolated from rest of the world. However, the scenario is quite different today. With development of roadways traveling has been made easy in Chamba. Now it is easily accessible from every part of India through a network of rail/air and road. There is no direct rail connectivity to Chamba. Pathankot is the nearest railhead for the city. Those wanting to travel by rail may get down at Pathankot Junction Station and then take up road transport system from there. For list of trains passing through Pathankot Junction Station, you may click here. Buses for Chamba can be availed from the smaller Bus Stand located near the Pathankot Junction Station. Most of these buses are run by Himachal Road Transport Corporation (HRTC). Many private agencies also run regular bus service in this route. There is also a Taxi Stand located close to this Bus Stand. If you are interested in a swifter and more comfortable journey you may also consider such an option. If you want to reach Chamba from Pathankot by road there are three options to consider. In each case, you must first take up NH 20, which is also known as Pathankot Mandi Road. In the first option you need to drive along NH 20 until you reach Nurpur in Himachal Pradesh. From there, you need to take State Highway 28 and keep on driving until you reach Lahru. Here you should turn left to continue on SH 28. Keep on driving until you reach Tunuhatti. From here you take up SH 33, which ultimately takes you to Chamba. A second alternative is to take SH 27 and then Chamba Road. In this option, you first take NH 20 and then SH 28. Instead of turning left near Lahru to continue on SH 28, you continue straight and meet SH 27, which ultimately meets Chamba Road. Cross the Shitla Bridge across River Ravi to enter Chamba. The third option is to start on with NH 20 and drive until you reach Haryal. Here at 32.29 N and 75.75 E, you take a left turn and enter State Highway 33. The road passes through Baniket and Chamba to end in Tissa valley. It generally takes around three hours to cover this distance. To reach Chamba from Gaggal you must first take National Highway 20. It meets State Highway 43 near Hatli at 32.22 N and 76.17 E. The later is also known as Shahpur Chowari Raod. At Chowari you need to take SH 27. Keep driving until you find Chamba Road on your right. Cross the Shitla Bridge across River Ravi to enter Chamba. It is easy to visit Chamba from Dalhousie, a popular tourist resort near Chamba. If you start in the morning from Dalhousie by taxi you will reach Chamba by lunch. A one way trip by taxi is going to cost you around INR 400. You may also try trailers running between these two cities. In such a case, you may have to pay INR 100 per seat. Majority of buses plying through Chamba are run by Himachal Road Transport Corporation. 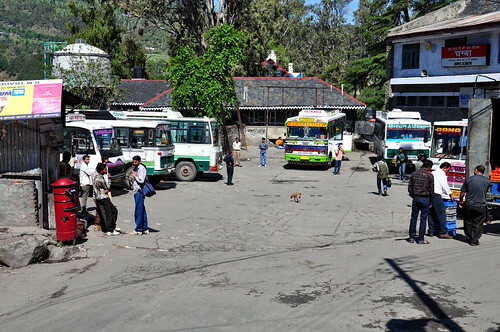 The Bus Stand is centrally positioned close to the Chougan on MDR 52 and hence is easily reachable from every corner of the town. While tickets for your bus journey can be bought from the bus stand only you may also avail their online booking option. To contact the Booking Office over telephone you may call at 01899-254280. Everyday four buses belonging to the Ordinary category leaves Chamba for Pathankot. They start at 8:30 AM, 9:50 AM, 1:30 PM and 11:15 PM respectively. The fare is INR 160. HRTC also runs three Ordinary buses from Chamba to Gaggal. They leave Chamba at 5:30 AM, 11:30 AM and 5:00 PM respectively. Depending upon the route the fare ranges from INR 229.00 to INR 259.00. In addition, the Corporation runs four ordinary buses to state capital Shimla. On way they stop at a number of important cities like Kangra, Solan, Una, Hamirpur, Bilaspur etc. Depending upon the route the fare ranges from INR 536 to INR 576. Buses for Delhi are also available from Chamba. HRTC runs one Ordinary and one Himgaurav (TATA AC) bus from Chamba to Delhi. The fare for the ordinary bus is INR 630and it leaves Chamba at 12:50 PM. The fare for Himgaurav is INR 1,000 and it leaves Chamba at 4:15 PM. Both these buses travel via Pathankot. Major District Road 52 (MDR 52) is the most important road in Chamba. It starts near Shitla Bridge across Riaver Ravi and then runs right through the town. The most significant areas of the town are located on both sides of this road. Other than this, some other important roads in this city are Chamba Pathankot Road, Dahousie Road, Chamba Bypass Road, Chamunda Road etc. While private taxis are available for sightseeing, most visitors prefer to walk around the city. This allows them imbibe the spirit of the place and enjoy every moment of the stay.